Casey Jones Train Conductor hat made from 14 pt. high density paper poster board is liquid laminted for a high gloss finish. 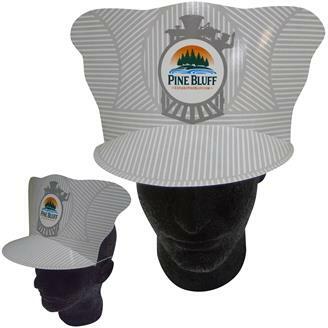 Drop your logo into the preprinted area on the grey pinstriped hat with train graphics. Ideal for schools, public safety days, transportation facility, parties, and train outings. Shipped flat with minimal assembly. Quick turn, just ask. Hat is held in place by an elastic band. Imprint Area : 2" Round Circle.